While Americans still lead the world in monster-sized food, our cross-Atlantic compatriots the British aren’t content to let us rest on our laurels. Pressing us in the giant hamburger category is a little dish called the Super Scooby from fast food joint the Jolly Fryer in the Bristol village of Filton. This thing is so big it makes the double Quarter-Pounder from McDonalds look like a can of Slim-Fast! 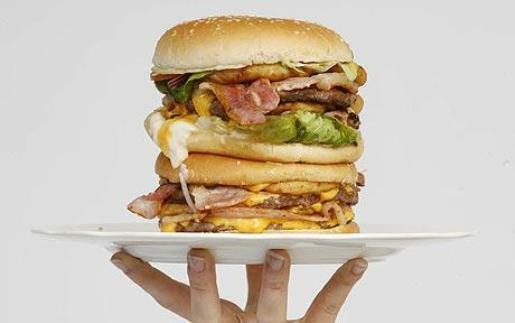 Here’s the run-down on the Super Scooby: 4 quarter-pound beef patties, 8 rashers of bacon, 8 slices of cheese, 12 onion rings, 3 types of sauce (burger sauce, mayonnaise, and barbeque sauce), 6 slices of tomato,2 leaves of lettuce, relish, and an unhealthy white bread bun. If you can finish all that AND an extra-large side of fries, you earn a free can of diet soda! So far, no one has earned that beverage, but it’s only a matter of time before a competetive eater comes along and smashes that burger into delicious wreckage. In my younger days, I would’ve loved to take on that challenge myself (if they’d let me eat the burger without the cheese and mayo). Now, though? I’m too weight-conscious to even attempt to eat a whole day’s worth of 2,500 calories (plus 165, not counting chips) in one setting.